Click To Read Latest Customer Reviews & Ratings on Amazon.com, Now! Generac 6602 4-in-1 PowerDial 3100PSI 2.8GPM OHV Gas Pressure Washer is a gas run pressure washer which is a perfect device for washing your cars, decks, sidings, masonry, driveway and much more. The device’s specific setting will provide you the optimal pressure and water flow for multiple cleaning. You can select your different cleaning job and adjust the output pressure according to your need the awesome power dial. The versatility and power of the device give you an amazing feel by making your cleaning job easier. Unlike the other pressure washers in the market, you can fold its handle to maximize your space in the store room. Cleaning the detergent tank is much easier in this device as it uses a wonderful drainable detergent tank. The features and the technology will change your washing experience and will provide you a good feel. The device has an amazing feature that is 4 in 1 power dial to let you decide what kind of cleaning you intend to do. On top of the engine, there is a dial which shows four different options for different use. It starts with a minimum power or water pressure that is suitable for your beautiful car wash and ends in maximum pressure for heavy duty washing jobs. The middle two options are for house cleaning and washing the fence. This feature saves your fuel as well from unnecessary using. Generac 212cc OHV engine is rated the most powerful engine in its class which is manufactured by Generac themselves. It produces a massive water pressure of 3100 PSI and 2.8 GPM of water output. The manufacturer put the power of 3100 PSI which comes under the commercial territory to make your tough cleaning job smooth. Generac 6602 4-in-1 PowerDial 3100PSI 2.8GPM OHV Gas Pressure Washer is a compact product that measures 20.6 inches in length, 39.5 inches in height and 21 inches in width. The light weight of the product which is only 69 pounds makes the bearer carry the device easily using its flexible wheels. The product comes with a 30-foot high-pressure hose. It has an integrated 3/4 gallon detergent tank with a drain plug to quickly empty the tank and clean it. The detergent tank is placed right under the engine for your effective use. An Axial Cam Pump has been used in this device for the hose to be connected easily with the pump. Three different nozzles are provided with the machine which is 0, 25-degree and a soap nozzle. Strength and Power: You definitely don’t want to be interrupted because of the lack of power in the middle of your cleaning process. 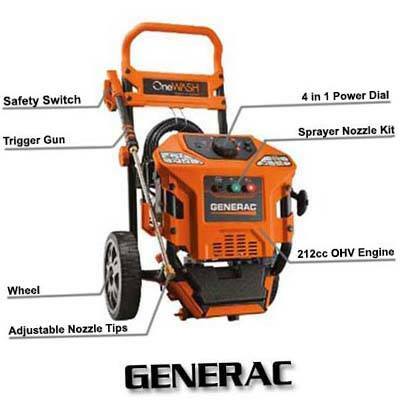 With this Generac 6602 4-in-1 PowerDial 3100PSI Gas Pressure Washer, you will never feel it. The 212cc OHV engine produces 3100 PSI water pressure with the water flow of 2.8 GPM. You can happily carry on with your washing job and spend your free time with your family and friends. Variable Pressure Control: The device lets you choose from its four different cleaning options that start from maximum water pressure to do the heavy duty cleaning. When you decide to clean your fence or your house you can chose the middle two options because they provide you the required water pressure. When you are cleaning your car you can use the fourth option or the minimum water pressure which is ideal for your car wash.
Drainable Detergent Tank: The detergent tank has a drain plug to empty your tank easily. Unlike the other pressure washers, you don’t have to worry about cleaning your detergent tank after using it. You can easily open the drain plug to empty it and use water to clean it. High-Pressure Hose and Pump: You will get a 30-foot long high-pressure hose along with the device. You can stretch your spray gun far away from the machine. It has an Axial Cam Pump and it is very easy to connect the hose with a pump. This kind of pump is ideal for residential use and is easy to maintain. Warranty: The Company provides you two full years of limited warranty. So if you have any kind of manufacturing problem you can ask for help. The manufacturer will provide you with proper help. Many of the users said that it takes three pull to start the engine which they considered as annoying. 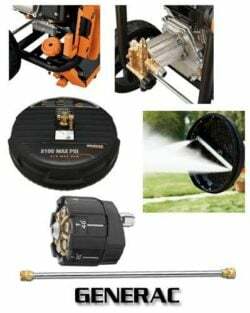 In this expensive world when you have many expenses Generac 6602 4-in-1 PowerDial 3100PSI 2.8GPM OHV Gas Pressure Washer comes within your budget. If you consider all the features and facilities it will provide you everything you need in your washing business. The foldable handle, powerful engine, high-pressure hose, drainable detergent tank, the unique power dial, it combines all. The features made the device one of the best pressure washers available in the market. It will be a very good investment if you buy this product. Check Latest Price & Buy it on Amazon.com! If hose is not long enough which kind can I use in it’s place and what else will I need to make this possible hose connection fit well…. Thank you for the requested info….. It depends on your pressure washer model. You can read our hose reviews and guides that will help you to get the best idea about all types of hose and which hose would be best fit with your machine. Let us know if you have any more specific questions. We will try to solve it by our experts.